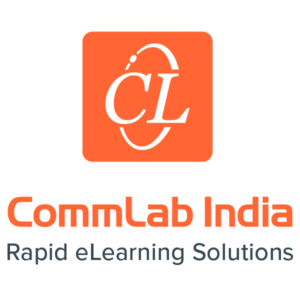 CommLab India is the most sought-after global leader for rapid eLearning solutions. Our formidable authoring tools expertise and years of experience in L&D and instructional design makes us the most reliable partners in your eLearning journey. Started in 2000, CommLab India has been ranked among the top 10 e-learning development companies in the world for three successive years. The company has more than 100 International customers in 30+ countries. ILT to eLearning Curriculums: We convert your Instructor-led Training (ILT) material – PowerPoint decks, Facilitator guides, and Participant handouts –into instructionally sound, visually appealing, engaging and effective eLearning curriculums. We also convert the same content into different digital formats like micro learning, mobile learning nuggets, just-in-time job aids, and performance support learning assets. We equip you to accompany your learners through their learning journey, ensuring they beat the “forgetting curve” and get the best out of your training investment. Legacy Course Conversions: We rejuvenate your legacy courses (created in Flash or any other authoring tool) and make them compatible with multiple devices and browsers. Even if you do not have source files, we can still retrieve their content and digital assets and publish the courses to HTML5 format using the latest authoring tools. We can give your online courses a fresh lease of life by recording, republishing, rebuilding or redesigning, according to your need and budget. By converting a substantial number of old courses to newer, multi-device formats, you get the best of your investment. eLearning Translations: We can translate your English language master eLearning course into 35 international languages – both text and audio. We not only translate, we also localize – taking care of colors, images, instructions, and navigation. We also re-integrate the course content and graphic assets together and publish them using the authoring tool of your choice. We use our huge pool of translation professionals experienced in various domains and industry verticals to turn out translated courses accurately and quickly. Robust Instructional Design: Our instructional design is utilitarian, appropriate, and highly effective. It is performance based on objectives, content, and assessments perfectly aligned with adequate interaction and engagement. eLearning Authoring Tools: Our developers are adept in the latest authoring tools such as Articulate Storyline 360 and Rise, Adobe Captivate, Lectora Online, and iSpring. Project Management: Our agile process that involves you in every step of the way – from understanding your learning needs to launching your eLearning course. Sell More: Empower your sales force through rapid eLearning solutions like micro learning, mobile learning and digital performance support on your products and selling methodologies. Rapid Proficiency in New Software: Train employees on enterprise software through rapid eLearning solutions as you can pursue course development in tandem with software customization. Supercharge Onboarding: Blend classroom, eLearning and mobile learning through rapid eLearning to provide an efficient, engaging and consistent onboarding process for your global, multilingual workforce. Stay Compliant: Avoid dense and boring content through scenario-based or story-telling instructional strategies via rapid eLearning that enable your learners to understand and apply regulatory concepts quickly. Stay Safe: The conceptual and knowledge sections of safety training can be taught via eLearning using scenarios, videos and case studies. Discover the Solutions CommLab India has to offer. Read reviews and discover other eLearning Industry community members's experience with CommLab India.